You may think one Philips pasta maker is as good as the next. After all, Philips is an established and well-respected brand, famous for its electronics. When you’re looking at similar products by the same company, can you really expect one to be significantly better? Is that truly the case? Does one surpass the other in terms of quality and ease of use? We’ll take a look at both the Philips Smart Pasta Maker and the Philips Pasta Maker and see if there’s a clear winner. This is the original model the Philips Smart is based on. Automatic mixing, kneading, and extruding are a feature on this early model as well. This pasta maker is an efficient machine, producing one pound of pasta in just 15 minutes. With four included shaping discs, you’ll be able to make fettuccine, spaghetti, penne, and lasagne. Along with the disks, the appliance comes with two measuring cups, a recipe book, and a scraping/cleaning tool. A built-in storage drawer means you’ll never be scrambling for your specialty tools. This machine weighs in at 20 pounds and has a 200-watt motor, capable of producing 1,600 pounds of force. The display and controls are easy to operate, with an on/off switch and a start/pause button. You also have a program and serving size selector. Flour is added directly into the body of the machine. After selecting the serving size, allow the machine to run a few moments before beginning to add the required liquid. It doesn’t cut the pasta as it leaves the machine, so you’ll want to have a sharp knife handy. While this model does make some noise, it’s not as noisy as a kitchen blender. It doesn’t use up the very last of the dough in the machine. You can let that dough be incorporated into the following batch, toss it, or cut it into pasta by hand. Don’t plan on using it for longer than 45 minutes at a time. The unit does come equipped with an automatic shut-off if the motor overheats. There is also a safety mechanism in place that prevents the machine from working unless closed properly. 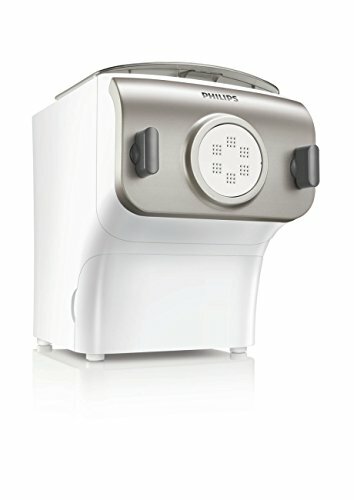 A Williams Sonoma exclusive, this pasta maker is Philips’s deluxe version. This model takes out all the guesswork of making pasta. It just doesn’t get any easier. A built-in scale weighs the added flour to determine the exact amount of liquid needed. There’s no need to worry about the consistency of your dough any longer. The Smart delivers large quantities of pasta in a short amount of time. In less than 15 minutes you can have a pound of fresh pasta. Fully automated, this machine mixes, kneads and extrudes. This unit is heavy duty and able to accommodate a variety of flours. You also have the option to use vegetables and juices for flavor, color, and texture. If you’re looking for a quality machine that’s able to produce delicious pasta, this unit fits the bill. Two measuring cups are included—one for liquid and one for flour. A scraping/cleaning tool, and a disk cleaning tool are also supplied. You’ll also receive a recipe book, and there are eight interchangeable disks for different pasta types and shapes. These include penne, fettuccine, spaghetti, pappardelle, tagliatelle, angel hair, thick spaghetti, and lasagna/dumplings. The user manual is easy to read with clear instructions. The machine takes only moments to set up. It is equally easy and quick to clean up and put away. A hefty, solid, unit, this machine has a 200-watt motor and 1,600 pounds of extrusion force. It is equipped with safety features, to prevent the machine from working when not properly closed. All removable components of this machine are dishwasher safe, making cleanup a breeze. The housing can be wiped clean with a damp cloth. This is a technologically advanced, well-made, low maintenance and easy-to-care-for model. This machine allows you to select the type of pasta you’re making, a start/pause button, has an on/off button, as well as a timer. While the mixing and kneading are automatic, the machine does not cut the pasta for you. Your freshly made pasta will be ready in just a few minutes. After making your pasta, the front of the machine removes easily for access to the main chamber for cleaning. These two models have a lot in common, including their automatic status and some of their included extras. They consistently perform well in the kitchen, producing a variety of different types of pasta. Both pasta machines are simple to put together and the included directions are clear and easy to follow. If you’re looking for a machine capable of making large batches of delicious pasta, either machine will work for you. You may be wondering, then, where these two pasta makers differ. You may even be wondering if there’s any significant reason why you would choose one over the other. Williams Sonoma is known for having top of the range kitchen products and accessories. The Smart falls right into this category. This machine comes with twice the number of disks as the original model, and high-tech functions the original model simply doesn’t have. The biggest difference between these models is the built-in scale in the Smart Pasta Maker. All you do is add the initial flour. The machine does the rest of the work, determining exactly how much liquid is needed, based on the weight of the flour. What does this mean for you and your pasta? This means you’ll always have pasta dough with perfect consistency. And, you’ll have it all without taking the extra time to weigh out the ingredients yourself. The earlier model relies solely on the included measuring cup. It’s in your best interest to use a separate kitchen scale to weigh your ingredients for optimal results. While the measuring cup is adequate for approximating the liquid you need, it’s not as accurate as the scale. Both models have reported fragile plastic components, prone to breakage. While the metal components and machine housings are sturdy, the plastic pieces can be problematic. Philips does not sell all of those pieces separately, either. While the automated settings simplify use, they don’t allow for the usual resting time between making and cutting. Without the appropriate rest time, the cuts can be more difficult and less clean. A small paring knife can take care of any less-than-perfect cuts. The included cleaning tool in both models could be more efficient, but even so, both machines clean well and easily. Unfortunately, the automated status of the machines means there’s no controlling the thickness of the dough. These machines present a very Americanized pasta. If you’re looking for a thinner, lighter pasta, you may need to consider a different appliance. There are many pasta machines on the market. While these two may have some drawbacks, they have many positives as well. They are both extremely easy to use. Even if you’ve never made your own pasta before, with either of these devices, you’ll be on your way in no time at all. If you aren’t willing to take the time to weigh your ingredients separately, you’ll want to go ahead and spring for the Smart. You’ll be consistently satisfied with the dough and pasta you are producing in the kitchen. If you’re looking for more included pasta options, you’ll also want to select the Smart. Additional disks are available for purchase for the other model. However, you may find buying the accessories brings you to the same price point—without the advanced attributes of the Smart. Advanced technology means there’s one more thing to worry about breaking. If you’re looking for a good quality, automatic product without the fancy whistles and bells, this machine is for you. Like more control in the kitchen and don’t mind the added step of weighing your ingredients? This is going to be the best choice then. Especially if you’re not looking for any additional accessories or attachments, you’ll be better off with this one. As mentioned above, if you choose to go this route and decide later on that you’d like to expand your options, additional disks may be purchased. Both of these Philips products are well-rated. With both being good performers and long-lasting, the deciding factors will come down to what you need in a pasta maker. Both machines are simple to use and reliable. You’ll be able to make large quantities of pasta in small amounts of time and the machines are easy to maintain. The bottom line is that either product will make you happy and work as it’s intended. You only need to decide if it’s worth spending the extra cash for the additional features of the Philips Smart. Newer PostNoodles vs Pasta - What’s the Difference?